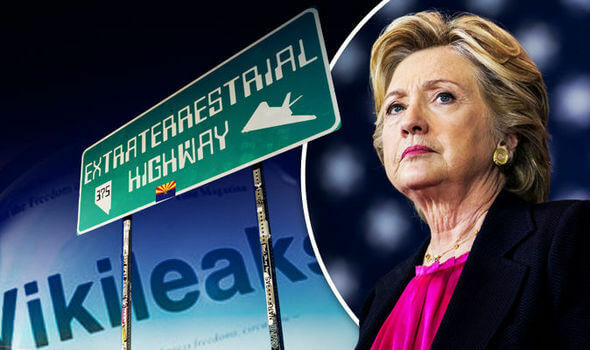 Home » Why Is Hillary Clinton Making Strange Comments About Aliens? Extraterrestrial disclosure lobbyist and activist Stephen Bassett has a theory: She knows more than the rest of us. In an interview with Pacific Standard, he explains the importance of Clinton’s remarks for his political movement, what might happen next, and whether or not we are in imminent danger. Stephen Bassett, a longtime political activist and Congressional lobbyist for the disclosure of an extraterrestrial presence by the federal government, received short mention in the Times piece. Curious to learn more about his reaction to Clinton’s remarks and his appraisal of her as a candidate from the perspective of someone lobbying for a decidedly non-mainstream issue, I gave him a call. Less than two hours after leaving him a voicemail, I received a callback and four emails in quick succession, laying out the relevant background. There were links to press coverage of his organization, the Paradigm Research Group, government documents, and a list of 16 detailed questions that he hoped the media would pose to Clinton. This is the biggest news story in history. And I don’t mean Clinton; I mean the presence of extraterrestrials. Bassett has been registered as a lobbyist since 1996, “pursuing the political resolution of the extraterrestrial issue.” What follows is a wide-ranging conversation about the politics of potential government disclosure of supposed top-secret documents on extraterrestrials, an issue which has only recently received attention outside a close-knit circle of conspiracy theorists. Pacific Standard cannot vouch for the veracity of any of the theories below. Given the recent coverage in the Times, which is certainly a mainstream, very well-respected paper, were you happy with that story? [Laughs] Happy. Uh. The Times finally got into the political aspect of this issue, 17 months after the competition was out there. It’s 17 months behind the curve. More importantly, the New York Times has the worst record on this issue of any paper in the United States, of any size. Probably the worst record of any major paper would be the Times of London. So yeah, after 20 years of pounding this, and after 17 months of generating unprecedented political coverage, it was nice that the New York Times entered the field. They contacted me. I spent an hour with Amy Chozick at the Times offices. Gave her a tremendous amount of material and contact. I’m the principal source on the article. Now, that’s not reflected in the article, because the Times is not … the article is not about me. That’s fine; she did a good piece. And she has a lot more information than that. You know a little bit of hockey, right? So in the last two days, we have seen the hat trick. In a space of two days, we have had an article in the New York Times, the Times of London, and the Washington Times. Which just kind of reflects that things are moving along pretty rapidly. I hope that this is only just the beginning. This is the biggest news story in history. And I don’t mean Clinton; I mean the presence of extraterrestrials. And it’s high time that the paper of record finally got on board. And what would you say the primary failing of the coverage of these issues is, by the Times and by other respected media outlets? Primary failure is to do appropriate journalism. Look, the truth embargo in this issue, which used to be called the UFO cover-up, began to be put together right after Roswell, in ’47. In order for the truth embargo to work, the U.S. government had to get the cooperation of the major newspapers and the networks. There were only three [networks] back then, and they were pretty much at the government’s command. They were part of the truth embargo. They serviced it. They knew there were limits, there were places they couldn’t go, there were lines they couldn’t cross. And as the years unfolded, they stayed with it. But when the Cold War ended in ’92, and then, the Internet era starts to really accelerate in ’95, the ability for those entities … to sort of contain the issue by not doing appropriate journalism has been eroding rapidly. And so the issue is overwhelming them; it’s like they’ve been running from a tsunami that’s finally caught up with them. Do we have proof of that? No. Is there any paper trail? Not likely. But I guarantee you, the Graham family [of the Washington Post], the publishers of the New York Times, worked out arrangements with the government to what their limits are on their coverage of this issue. Do you think the remarks that Clinton has made in recent months go far enough? Is she the best candidate in terms of dealing with these types of issues or lifting the “embargo”? Paradigm Research Group’s political initiative is not about electing any particular person. The reason that Secretary Clinton is the focus of this is because of her historical connection to the issue via the Rockefeller Initiative, ’93 to ’96. Which she has refused to talk about, and no one in the Clinton team has talked about it or mentioned it since. However, that’s changing because, starting in January of 2015, reporters that had been brought into this are now getting pretty intense into it, had been contacting her campaign and contacting John Podesta with questions. And they’re not answering them. Not a “no comment,” but no response. What is happening now is a very complex strategy being orchestrated by John Podesta. They are very aware that she is almost certainly going to have to confront this issue in full before she gets to the White House. She cannot make it to the White House without first discussing the Rockefeller Initiative with the American people. So the strategy, I believe, that Podesta, who is a brilliant man, is pursuing is that he and she are making statements, on cable news and on late-night talk shows, in tweets to the public and so forth, which are laying a track record of comments, which will insulate them against potential backlash when this thing blows out. But I can assure you that John Podesta would not be giving the interviews he’s given, he would not be putting out those tweets, and Secretary Clinton would certainly not have said what she said to the Conway Daily Sun, on Jimmy Kimmel, or on Power 105 FM in New York, if these individuals did not think that this phenomena was absolutely true. If they knew quite well that there was nothing to this—it was just a 60-year misunderstanding between the human race and the cosmos—then they would be saying none of this. The very fact they’re speaking at all should be a red flag to every single journalist. And what do you think, exactly, is going to be disclosed? Or, you don’t know? No, disclosure is easy. Disclosure is specifically stated by the advocacy movement as the formal acknowledgement of the extraterrestrial presence by heads of state. The moment the words come out of Barack Obama’s mouth—we have an extraterrestrial presence engaging us—that is disclosure. Now, anything else we learn after that will be a negotiation between the White House and the Pentagon and the American people, with the media almost exclusively on the side of the American people. And that negotiation will be a dramatic tug of war. And over the weeks and months that follow disclosure, information will emerge. Exactly what, and how much, and when remains to be seen. In terms of the initial disclosure, you’re saying that either Obama or Clinton will acknowledge that someone in the U.S. has had contact with extraterrestrial life? No. No, no, no, no, no, no, no, no, no. That’s not disclosure. Disclosure is the announcement of an extraterrestrial presence engaging the human race, however it is engaging. It’s not about the specifics. That this phenomena that we have been seeing all around the world for seven decades is extraterrestrial in origin. That is it. Secretary Clinton can’t make that announcement; she’s not the president. All she can do is answer truthfully her full involvement in the Rockefeller Initiative and give explanations for the comments going back to 2002 of her campaign chairman, her husband, and so forth. When you say extraterrestrial presence, what would you define that as? Non-human, intelligent beings, almost certainly from other planetary systems, of which we now know there are billions, with interstellar travel, maneuvering around in our airspace in advanced, anti-gravitic craft, and very possibly operating on the ground in various ways. That’s the extraterrestrial presence, at minimum. So, it doesn’t necessarily mean ground presence? Well, we know they’re on the ground. They’re seen on the ground, they’re seen landing. So yeah, they’re on the ground. Do they have bases here? Not confirmed. But I assure you, they’re not just flying around watching us, no. There’s a lot more to it than that. Are they living amongst us? This is a question that’s often asked. I don’t know. Do you believe Clinton or any other government personnel have had contact, or do you believe that they just have access to documents? Well, first of all, no, they don’t have access to documents. The Pentagon does not consider the president on a need-to-know basis. They have the same access to the evidence in the public domain, which is massive. They don’t have any access to inside government stuff held within the military intelligence community. As far as contact, I have no way of knowing if any members of the Clinton political team or members of Congress or members of the Pentagon are contactees. No way to know. But, given the numbers that we think are out there, it’s likely there are some. But that’s not that important right now. What’s important is the E.T. presence being announced, and then we’ll go from there. I’m not going to claim to be studied up on this, the exact details of the contact, but if you had to explain to someone what it has consisted of, other than that there’s been events or strange occurrences that have been observed by people all over the world, is there any particular—? Look, the contact phenomena is a very complicated and advanced aspect of this, which really cannot be addressed until post-disclosure. And it won’t be easy, and it won’t be comfortable. The only thing I will say about it now [is] over the last 30 years, nearly one million written accounts, maybe even more than one million written accounts from individuals describing contact of one type or another, have been sent to researchers around the world and rest in their files right now. Most of these have been reviewed by one or more researchers. There is a consistency to these reports that is extremely persuasive. And that’s really all I can say at this point. You must get this question all the time, but what do you say to the people who just say you’re a conspiracy theorist or a guy who allows his hope to seep into his perception? It’s not about convincing, it’s about getting government policy changed. And there are plenty of people who simply don’t know what’s going on, they’re not informed. I don’t take offense. It’s not a problem, and it’s not going to affect the disclosure movement much at all. Knowing what you do, and having done the research that you’ve done, you don’t think we’re in danger, do you? You don’t think this is a national security or global security issue? By definition, the presence of extraterrestrials is a national security matter and has been from day one. I understand that, that’s why I call it a truth embargo and not a cover-up. It was perfectly legal for national security reasons. Second, based on what I know of the totality of the evidence, I am relatively confident that after disclosure’s taken place, and even after open contact, which I believe will probably follow within a relatively short time, the world’s people will be pleased with what they have learned and where this is going. That is my view. If I had hard evidence we were in for an extremely rough time, I would say so. I don’t see it. Doesn’t mean that’s not the case. But now, I want to add number three. And this is a meme that’s been out in the Net for some time, fortunately: We have to be extremely wary that some element of the government—doesn’t have to be the entire government—or intelligence branches may foolishly decide that selling an alien threat as part of the disclosure process will serve their interests. Because, you know, every nation in the world has got its certain share of war mongers running the show. And, trying to sell, falsely, an alien threat would be a colossal blunder on the part of government, which is not unfamiliar with colossal blunders. On the other hand, if there is an awful threat by extraterrestrials, and they come forward with clear evidence in a forthright way, then we will listen and act accordingly. And knowing the sort of vitriolic rhetoric of Donald Trump, are you worried about what he might say about all this? Over the last 26 years, we have seen one of the worst and most vicious eras of political partisanship in American history. And where the two parties are attacking everything, everything, and candidates are attacking everything: your looks, your dress, your clothes, your relatives, your cat, your dog, making up lies if they have to, revealing every skeleton in every closet. It’s absolutely a bloodbath. And yet, even though the Republicans were well aware of the Rockefeller Initiative, during the most bizarre campaign in history, in all of that time, not a single Republican candidate or the RNC has ever attacked any member of the Clinton political team over the extraterrestrial issue. No tinfoil hats, no beanies, no nothing. And that is inconceivable. If Hillary Clinton wore a mismatched pantsuit, she would be ripped by right-wing press. The reason the Republicans have not dared to attack the Clintons on this issue is because the Republican brain trust is fully aware there’s an extraterrestrial presence. Do you believe in the sci-fi aspect of the government actually having some kind of, the Area 51 theories, where there’s an alien imprisoned or something? There is evidence that we have crash vehicles and dead bodies and have had living aliens, yes. Captured. That’s not the same thing as working with them hand-to-hand in some underground facility. Do we have underground facilities? Absolutely. Is that where I think most of this is operating? Absolutely. But, do we have arrangements with E.T.s? Not proven. Do the E.T.s have underground bases? Not proven. Likely, but not proven. And it’s not sci-fi, this is just basic assessments from what we do know. But because of the truth embargo, we have too many theories and not enough facts, which is what the government wants. The more enmeshed you are in theories without facts, the more you just wander around in circles going nowhere. We need to drop the theory quotient and increase the fact quotient by many, many magnitudes. If you had to lean one way or the other, it would be toward a non-adversarial relationship developing between humans and extraterrestrials? I can’t predict every aspect or component of the relationship that this planet may have with multiple species.